Months ago my Mom sent me a great selection of baseball cards collected by my Dad as a kiddo (she sent me cards that were in poor condition and of little value to collectors). Her idea: turn them into books. After a bit of experimentation, I discovered that some of the cards could be split in two. I adhered the pieces to book board to form the front and back covers. An old white purse gave up its life to provide leather for the straps. Red thread sewn to the split straps came the closest to resembling a baseball stitch. I love the wonderful colors and imperfections of the cards; and they bring back good memories of my Dad. 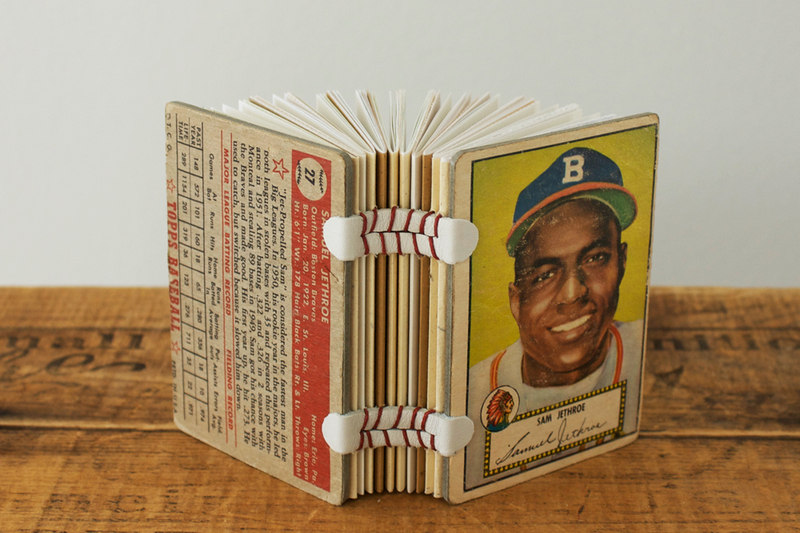 A selection of baseball card books is currently available in my Etsy shop. This entry was posted on Sunday, June 13th, 2010 at 11:49 pm	and is filed under Bookbinding, erinzam's Work, Etsy. You can follow any responses to this entry through the RSS 2.0 feed. You can leave a response, or trackback from your own site. I can see the little guys with fists full of rubber-band-bound baseball cards drooling over the chewing gum and the cards as they traded. Their bicycles were parked nearby. Your Dad was one of the wise little guys that did not clothespin his cards to the spokes. And look at you. Awesome creation! Incredible detail. Everyone benefits. How fun!